Set within the vast desert of northern New Mexico, a massive, 357-foot tall mesa stands proud. Known as Acoma Rock, the craggy, flat-topped mountain is home to Acoma, a National Historic Landmark, and one of the oldest continuously occupied communities in what is now the United States. The pueblo’s lofty, isolated location made it virtually impenetrable throughout the precontact period, which allowed the village and its people to flourish and develop distinct cultural traditions – many of which the Acoma community still honors today. Founded as early as 1100 A.D and evolving throughout the centuries, Acoma illustrates the significance of early native peoples in New Mexico and the profound influence of Spanish culture in the Southwest beginning in the 16th century. The pueblo is home to the San Esteban del Rey Mission Church, which the Spanish Franciscan friars built in the early 1600s. 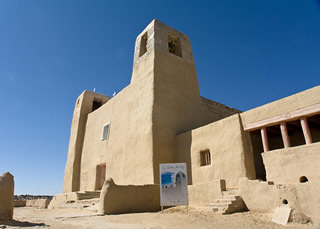 The mission is the oldest surviving European church in New Mexico and an impressively large, stately presence among Acoma Pueblo’s adobe homes. The pueblo illustrates the amalgamation of European and Native cultures in New Mexico and helps illuminate the history of Spanish contact and interaction with the ancient peoples of the United States. Opinions differ on the age of the Acoma Nation and its mesa-top pueblo. Traditional Acoma oral history tells of an ancient city far older than our imaginations and current calendars can comprehend. “Acoma” itself translates in local dialects to a “place that always was” and legend tells that the Acoma people have lived on the mesa forever. Scientific, historical and archeological evidence dates the Pueblo’s oldest extant remains to around 1100 A.D. and suggests that the Acoma people likely lived in the desert surrounding the mesa during earlier times and at some point decided to scale the massive rock and move their village to the top. 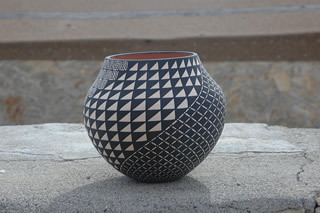 An extensive archeological survey of the pueblo in the 1950s revealed the ancient people to be prolific potters, and skilled artisans and architects. In the early 1500s, Viceroy of New Spain Antonio de Mendoza called for the first explorations into the lands north of Spain’s holdings at the time, which are now in modern-day Mexico. Rumors flew of vast cities of gold and incredible riches waiting for the Spanish Crown to claim them. Throughout the 16th and 17th centuries, many expeditions traveled into present-day Arizona and New Mexico. Even though Acoma sat isolated on its mesa, several Spanish explorers visited it, including Hernando de Alvarado in 1540 (a member of the Francisco Vásquez de Coronado mission), the Chamuscado-Rodriguez expedition in 1581, Antonio de Espejo in 1583, and Juan de Oñate in 1598. Early Spanish reports indicate that the pueblo was a village of roughly 500 three or four stories tall adobe houses. Windows were small and limited and doors at the ground level did not exist. Instead, residents entered buildings via ladders placed through holes in the roof. At the time, the only way to the mesa’s top was a series of hand and toeholds carved into the steep rock. The people had to carry all of the materials used to construct the original community up the cliffs on their backs. Because of its location, Acoma was one of the most resistant pueblos to Spanish rule. During early Spanish contact, reports indicate that the Acoma were friendly, often meeting expedition parties at the bottom of the mesa to greet and assist them. As time moved on and the Spanish presence became more and more persistent, however, the Acoma retaliated. In December 1598, residents lured Captain Juan de Zaldívar, one of Oñate's officers, into the pueblo and murdered him and 14 of his men. This had dire consequences for the village two months later when Zaldívar’s brother arrived with a force of 70 Spanish soldiers to avenge the deaths. A bitter battle resulted in the sacking and burning of much of the pueblo and the death of approximately 1,500 residents. The Spanish forced those who remained to surrender the pueblo to the Spanish. Oñate himself demanded sentencing survivors to indentured servitude and bodily mutilation. Oñate’s harsh and unfair treatment of the Acoma people would later lead to his legal expulsion from New Mexico and Mexico City. With the rebuilding of the pueblo under Spanish rule in the early 1600s, missionary efforts began to convert the Acoma to Catholicism and Spanish ways of life. Still, strong resistance remained among the natives, and the Spanish did not have a mission church constructed until the late 1620s. Although earlier priests visited the pueblo, Father Juan Ramirez is noteworthy as the first permanent Franciscan father to live in Acoma. It is likely that he began the building of San Esteban del Rey Mission Church upon his arrival in 1629, but the exact dates of its construction are unknown. The huge church, which still stands today, is an impressive work of architecture – especially considering that native workers had to carry all of its materials up the mountain. These materials included the church’s 40-foot long roof beams, originally hewn in the San Mateo Mountains, 30 miles away. The church is simple in plan, with a long nave and a polygonal sanctuary at its western end. Its exterior is impressively tall due to battered walls that are up to seven-feet high from the base, tapering up to a mere 30 inches at their peak. Two square bell towers flank the main façade and contain bells brought from Mexico during the 1800s. A one-story convento sits along the north side of the church and once housed living space, workrooms, and storage for the father and friars who were in residence. A large cemetery surrounded by a low wall sits in front of the church and contains the remains of both native and Spanish residents from throughout the centuries. During the 1600s, tensions remained high between the Spanish and native peoples throughout the Southwest. Most of the conflict centered on religious disagreements, and in 1680, many villages, including Acoma, took part in a large pueblo rebellion. The rebellion resulted in the death of several hundred Franciscan fathers, the destruction of many churches, and the death or banishment from pueblo towns of many Spanish residents. Acoma’s priest, Fray Lucas Maldonado, and the other Spaniards living in the pueblo did not survive the rebellion, but San Esteban del Rey Mission Church remained largely unharmed. It has continued to serve Acoma’s Catholic residents since Spanish re-conquest of Acoma Pueblo in 1699. Acoma remains today a rich mix of cultures--Native pueblo and Spanish influenced by Americans from other places in the mid-19th century and decades of Anglo-inspired customs and technologies. A vehicular road now connects Acoma to the desert below, making the treacherous toehold system obsolete and the community more accessible. Much of Acoma’s old pueblo character is intact with its flat-topped, adobe buildings laid out in what is believed to be a largely original streetscape. The Mission San Esteban del Rey is still one of the most striking features of Acoma. The church is the oldest Spanish mission in New Mexico and one of the finest examples of early Spanish-Pueblo architecture in the Southwest. Despite what many may view as negative associations the mission might have for the Acoma people, tribe members are committed to its care and continual restoration. A tribal group, the Gaugashti, do the work necessary to preserve San Esteban, and the church is viewed as a gem of Acoma heritage. Now Acoma itself has few permanent residents as most of its people moved to Acomita, a village 15 miles away. The Acoma use the pueblo periodically for festivals and sacred ceremonies, and important tribal elders still live on the mesa. The pueblo is a very popular tourist attraction for its cultural and heritage value, and the Acoma Tribal Council welcomes visitors for a small fee. Acoma’s impressive Haa’ku Museum and Sky City Cultural Center, which focuses on the revitalization of lost art forms, language, and the preservation of Acoma’s history, offers tours, educational programs, and exhibits. The center hosts many public events throughout the year including various dances, walks, and community gatherings. Acoma is on the Zuni-Acoma Trail, an ancient footpath connecting the old Zuni and Acoma Pueblos. Once used by both native peoples and Spanish explorers, the seven and a half mile-long trail is enjoyed by hikers through New Mexico’s beautiful lava beds. The Zuni-Acoma Trail is part of the El Malpais National Monument, which the National Park Service manages. Acoma is a National Historic Landmark located on Acoma Rock, on NM Route 23, 13 miles south of Casa Blanca, NM. Click here for the Acoma National Historic Landmark file: text and photos. 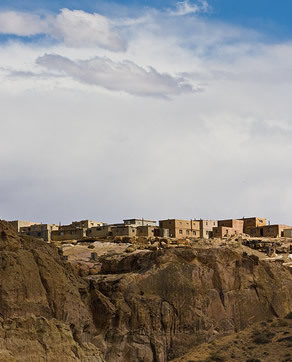 Tours of Acoma are available through the Haa’ku Museum and Sky City Cultural Center. Hours and admission costs vary. For more information, visit the museum’s website or call 1-800-747-0181. 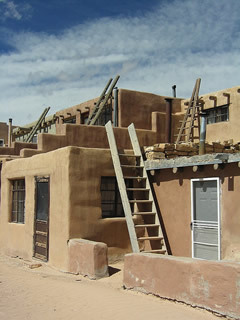 Both Mission San Esteban del Rey and the Acoma Pueblo have been documented by the National Park Service’s Historic American Buildings Survey. Acoma is also featured in the National Park Service American Southwest Travel Itinerary.